Yep, the poster has it right: Julius Caesar can rightly boast a stellar cast! Think of it: Charlton Heston! Jason Robards! John Gielgud! Diana Rigg! Robert Vaughn! OK, maybe we're stretching things now, but one can't argue with the impressive collection of actors rounded up for this stab at Shakespeare (no pun intended). As longtime readers know, I LOVE The Bard, so any adaptation (even contemporary ones like 10 Things I Hate About You) get my attention. Julius Caesar has some impressive cinematic decisions, and one very bizarre performance (one of the reasons explaining as to why the film failed in its release). I think time has been kinder to this Julius Caesar and that a major reevaluation should be taken. Granted, I have not seen the 1953 version and suspect it is better, but I'm not judging the 1953 version. I'm judging the 1970 version, and that version is pretty good (though not without one of its most infamous flaws). The mighty Julius Caesar (Sir John Gielgud) has returned in triumph from the wars in Spain. His loyal friend Marc Antony (Charlton Heston) urges the crown of a king, but Caesar will not take it. However, Casca (Robert Vaughn), who witnessed this, informs Caesar's best friend Brutus (Jason Robards) and Caesar's enemy Cassius (Richard Johnson) that each time he seemed more and more reluctant to refuse it. As far as Cassius is concerned, Caesar plans to be made King, an affront to the idea of the Roman Republic. He soon gathers himself a conspiracy to assassinate Caesar, but pushes for Brutus to join in. Eventually, Brutus does so to save the Republic from tyranny. Caesar meanwhile, will not listen to the warnings of his wife Calpurnia (Jill Bennett) nor the Soothsayer who calls out to Caesar to 'beware the Ides of March'. At first, Calpurnia's dreams dissuade Caesar from going to the Senate, but he is persuaded back into going. There, Great Caesar falls after a volley of stabs, with Brutus' being 'the most unkindest cut of all'. After the assassination, the conspirators do not hide. In fact, they claim to have done it for the most noble of reasons. Over Cassius' objections, Brutus allows Marc Antony to speak at Caesar's funeral, but cannot speak against them. Brutus at first gets the crowd on the conspirators' side with his speech, but when Marc Antony takes his turn with his "Friends, Romans, Countrymen" monologue, the crowd becomes so enraged that they pursue the conspirators. Now forced to flee, they attempt to make war, with Marc Antony and Octavius Caesar (Richard Chamberlain) joining forces. At war, Cassius 'betrays' the cause by taking bribes, and only Brutus maintains his morality of his actions. All the conspirators are vanquished, but Brutus (being an honorable man) commits suicide by falling on his sword, and Marc Antony mourns the loss of this, "the noblest Roman of them all". If anything sinks Julius Caesar from being as good as it could be, it is Jason Robards inexplicably bad performance as Brutus (whom I think the play is really about). As far as I read the play, it is Brutus' internal conflict between his personal love for Caesar and his beliefs about the evils of tyranny that should be the driving force. With that, why was Robards allowed to give such a cold, unemotional performance? He is exactly the same whether he is being drawn into the conspiracy or attempting to hide it from his wife Portia (Diana Rigg). Brutus is more blank than conflicted, and given that Robards was an extremely good actor (one of a handful of people to win back-to-back Academy Awards, both for playing real people), it is breathtaking to see how bad, how wooden, how emotionally removed he is from everything. There is simply no sense of passion of any kind in Brutus, and it is a failure of both Robards and director Stuart Burge that Robards was allowed to be so frightfully bad. Jason Robards' performance in Julius Caesar should be watched if only in a 'Don't Let This Happen to You' type of study. Fortunately, Burge managed to do other things right that offset the Robards bungle. 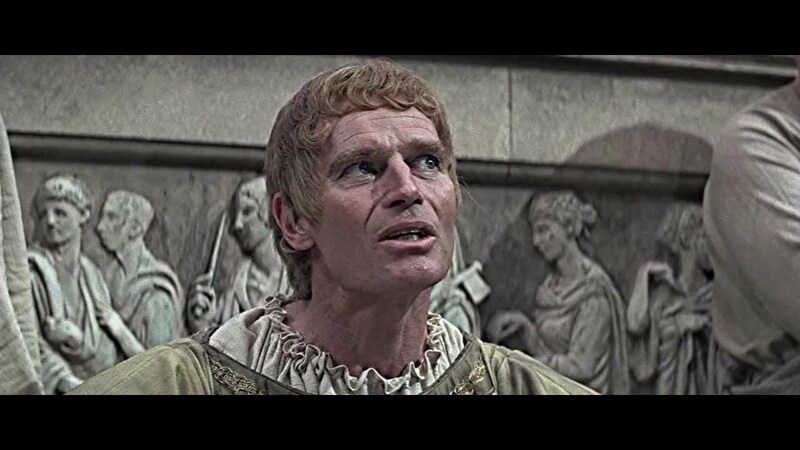 Julius Caesar I think should permanently put to rest the idea that Charlton Heston was in any way shape or form a bad actor or worse, someone who could not act. Sure, Heston gave bad performances, but what actor has not? It takes a great deal of skill to hold our attention for as long as Heston does with the "Friends, Romans, Countrymen" speech, and one is amazed at how well Heston holds the screen through a very long performance. Antony's fury at seeing Caesar's corpse rises slowly, until he finds himself determined to 'cry havoc and let slip the dogs of war' is quite impressive. Let's face it: Charlton Heston outacted Jason Robards. There are also fine performances from Sir John Guilgud as the haughty but betrayed Caesar. His farewell to his friend, "Et tu, Brute?" is heartbreaking. I imagine that Richard Johnson and Charlton Heston became friends, for this is their third collaboration that I have seen (the TNT presentations of A Man For All Seasons and The Crucifer of Blood coming years later). His turn as Cassius is brutal and harsh and quite effective as the man consumed with anger. I also have to give Burge credit in certain images that give Julius Caesar a better thought-out imagery than it has been given credit for. The opening sequence where we look over the skeletons of those killed in the Roman civil war make it almost look like the dead are calling out "Hail, Caesar!" in an almost mocking or condemning tone, and Calpurnia's dreams were quite freaky. Sometimes these images (like when Caesar's Ghost appears to Brutus by flickering candlelight) might be bit more hit-and-miss, but on the whole they work well. What I find fascinating about Julius Caesar is that for me, it is about the power of speech as a tool of persuasion. The battle between Brutus and Marc Antony boils down to which one can persuade the crowd to join them. Julius Caesar to me is not about the moral conflict of Brutus or the historic accuracy of the play itself. Instead, it is about how the mob, the common folk, can be ruled or manipulated by oratory. As a side note, we see this now, with so many people flocking to support The Donald in his bid for the Presidency. It is his 'tell it like it is' style that makes so many rally to his cause (whatever it might actually be). 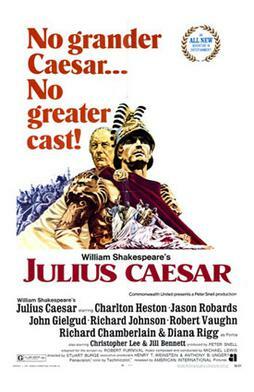 This version of Julius Caesar may almost be brought down by Jason Robards' simply astonishingly bad performance, but if you forgive that, and decide to focus on Charlton Heston's powerful performance, along with the rest of the cast, this is a pretty good version of Shakespeare's work.